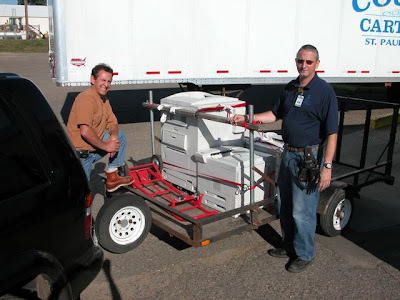 This morning Ed and I picked up the remaining items from Computers for Schools. As all four of the printers are large-format HP LaserJet's, this move would not have happened if it hadn't been for Eddie's trailer. These large format printers will allow us to print expansive views of students concept maps and other graphic oriented content. In the picture you can see David K from Computers for Schools signing over the printers to us. Volunteers continue to make things happen!